If you’re in the market for a thermal fluid heater, there are many important factors to consider before deciding on a product and making the purchase. From shopping industrial heating system providers to find a partner you can truly rely on to considering your heater options and selecting the one best suited for your applications and facility, there’s a lot to contemplate throughout the purchase process. While focusing on the applications and the heat output of the heater may seem most important when you’re selecting the best heater for your facility and use, it’s also imperative for those shopping for thermal fluid heaters to pay attention to factors that could affect the efficiency of the heater, as well as the life of the heater and the fluids it will heat. At American Heating Company, we strive to design industrial hot oil heaters that excel in each of these categories. Here, you’ll learn more about what sets our heaters apart so you can be well prepared when it comes time to choose a new thermal fluid heating system for your facility or plant. The average and maximum flux rates are extremely important when considering tube life and thermal fluid life in a hot oil heater. The average flux rate is defined as the heat duty in the radiant section divided by the surface area in the radiant section, while the maximum flux rate is the maximum rate at any one spot on the heater tubes in the radiant sections. It’s important to remember that both the heating coils and the thermal fluid last longer when exposed to lower film temperatures and tube metal temperatures due to lower flux rates. As a result, heaters with lower flux rates typically last much longer than those with higher flux rates. American Heating Company thermal fluid heaters are constructed using serpentine coils. The average flux rate for our heaters is approximately the same or slightly lower than our competitors. However, the maximum flux rate for our thermal fluid heaters is approximately 1.8 times the average rate, while for heaters constructed with tightly wound helical coils the maximum flux rate is approximately three times the average flux rate. Because our heaters feature serpentine coils and lower flux rates, they last much longer and can be used with less expensive heat transfer fluid. This can save you money in the short term and in the long term. Volumetric heat release, or combustion loading, is another key factor that influences the life and efficiency of a thermal fluid heater. When comparing similarly sized heat duty thermal fluid heaters, heaters from American Heating Company typically have much more volume in the radiant sections. As a result, the volumetric heat release for our thermal fluid heaters is typically much lower than that of our competitors, leading to lower flux rates and no impingement of the flame on the radiant tubes. This helps to keep flux rates within acceptable limits – and helps to extend the life of our heaters. When it comes to choosing a thermal fluid heater, surface area is important for a number of reasons. The radiant surface area of a heater impacts heater life, temperature, fluid type, efficiency and more. American Heating Company’s thermal fluid heaters have large radiant sections and finned tube economizers, giving our heaters more than twice the surface area when compared to many competing heating products. Corrosion allowance powerfully impacts how long a heating coil will last. At American Heating Company, our heating products use schedule 40 tubes, which have a significant amount of corrosion allowance. This, combined with the other factors we take into account when designing and constructing our thermal fluid heaters, enables our heaters to have longer lives – making them an efficient and cost-effective choice for plants and facilities in a variety of industries. The serpentine radiant coil is connected with return bends and the coil is not bent mechanically like a helical coil is during the manufacturing progress. The wall thickness of the helical coil is thinned during bending giving that type of coil less wall thickness than when a tube is not bent as in the serpentine coil design exclusively offered by American Heating Company. When it comes to heater life and operating costs, control systems are an influential factor. At American Heating Company, we use fully modulating controls on all of our heaters, in addition to all of the safeties that we normally include. As a result, our heaters can be regulated and controlled as necessary in order to increase efficiency, optimize fuel life, and extend the life of the heater itself. If you’re in the market for a new thermal fluid heating system, be sure to consider all the factors discussed and how they will affect the life of the heater and the thermal fluid it heats. Once you do, turn to the industrial heating experts at American Heating Company for all your heating needs. For over 30 years, American Heating Company has been producing the highest quality and most efficient thermal fluid serpentine coil heaters and industrial heating products on the market. We are confident that our state-of-the-art thermal fluid heaters and industrial heating equipment can meet your facility’s needs. 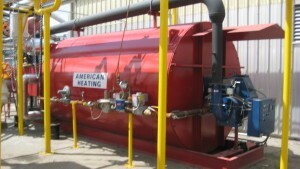 From custom thermal fluid heaters to comprehensive industrial heating systems, American Heating Company is the company to call. Put These Industrial Heating Advantages To Work at Your Plant or Facility! Interested in learning more about what purchasing an industrial thermal fluid heater from us entails? You can learn more about the AHC purchase process here. Curious about the other factors that us apart from our competitors? Find out why so many plant managers trust American Heating Company for all their industrial heating needs. Want to know more about the specifics when it comes to implementing our equipment in your plant? Contact us today at (973) 777-0100 or request more information using the form below to reach out to a representative for more information and to discuss your specific needs. Industrial Website Design & SEO by Mannix Marketing, Inc.